The Super Eagles striker continued from where he stopped last season by scoring a great goal. Odion Ighalo was not in the starting line up but came on in the 74th minute for Jurado as Watford were looking to protect their 1-0 lead against Everton. Ross Barkley scored a screamer in the 76th to make it 1-1, in the 83rd minute of the match super sub Odion Ighalo showed the world why he is highly rated in the championship, the Super Eagles striker left Chelsea target John stones for dead with a dummy before scoring a beautiful Golazo. The match ended 2-2 as Kone equalized for Everton in the dying moments of the match. 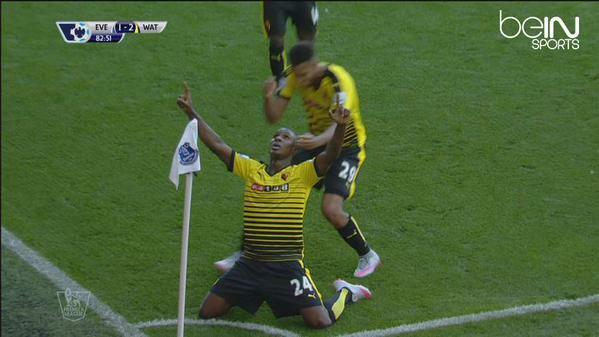 17 - Odion Ighalo has scored the most goals of any player in England's top four tiers in 2015. Prospect.